It is a true fact that walking in the wilderness can be dangerous. There are wild animals, the stalking kind that only introduce themselves shortly before they kill you. Poisonous plants will reduce you to a blubbering mound of oozing itch. Tree roots grab your ankles, wrench you to the ground, the better for snakes to strike you. Cliffs lure you over their edges with glorious views. The only thing that could possibly enhance the danger of the experience is a walk in the wilderness with a gang of strangers. I have a friend who shall remain nameless (Tracey) who talks me into all sorts of questionable adventures. Life-threatening things like ocean kayaking, and fried foi gras with sour cherry sauce (the deliciousness of which still haunts me). Martinis with vodka AND gin. Only she could have convinced me that hiking with a group of people I’d never met — a large group — on a trail I’d never seen, was an idea worth considering. It’s a very interesting concept, the hiking meet-up group. E-mails fly back and forth all week. The route is outlined, the difficulty assessed somewhere between easy and advanced, and at the designated time cars full of people, friends and strangers alike, roll up at the designated place. People of all sizes and fitness levels tumble out. And unpack serious hiking equipment. Trekking poles. UV rated hats. Poison oak balms. Water filtration systems. Ultra-light packs. They are young. They are middle-aged, like me. They are in their eighties. They are the kind of hikers who like to chat. Also the quiet kind. They stick together. They unravel from the group and catch up later. They are grateful to spend some time in nature with like-minded folk. It’s as simple as that. So we set out. We formed conversational alliances and disbanded them. We surged forward and fell back. I set eyes on trees and hillsides, flowers and rock formations I’d never seen, though I’ve hiked and ridden my horse in the area for years. We stopped for lunch after six miles. 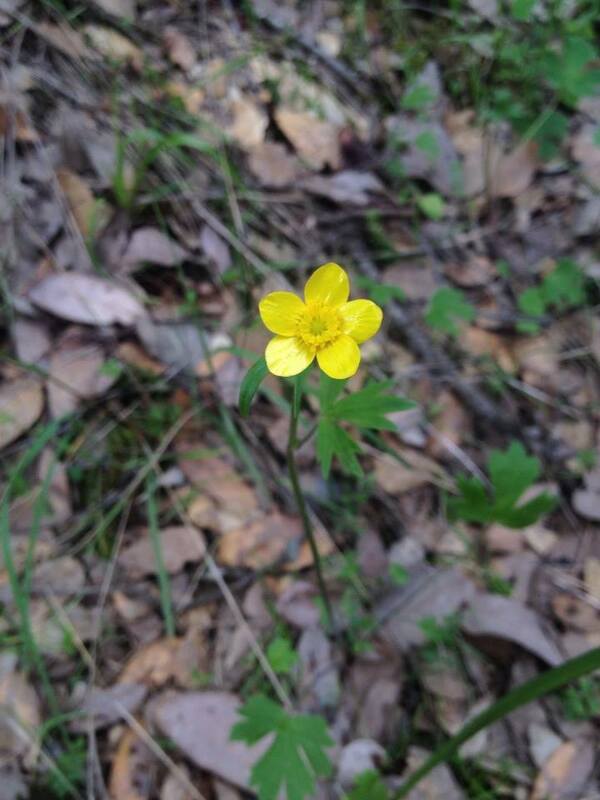 We shared our scant food, discussed the route, the other trails we’ve walked. Some things about the day stand out. The man in his mid-eighties who spotted, with his eyes so much older than mine, the jewel-toned redbud trees I’d missed amongst the tangled oaks, buckeye and manzanita. I hadn’t been able to see the trees for the forest. 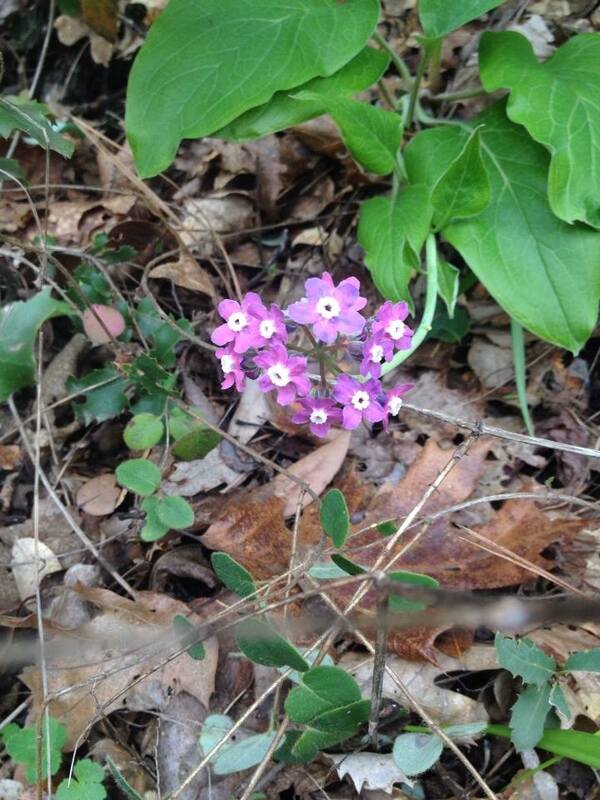 He pointed out where they spilled, as if out of an overturned jewelry box, all the way down a densely grown hillside. Another man, younger, kind and very rugged, a retired prison guard, let it drop that he was observing the anniversary of the death of his mother. And also his birthday. On the same day. As he’d done for years and would do for the rest of his life. He was the one who pulled out a flask of Jameson’s Irish Whiskey at the lunch stop, and we drank a wee toast to the fact that our parents do in fact take some part of us with them when they go. We drank to happiness and sadness, which so often walk a ways together. We saw slender promises of summer from Mother Nature. For the first time in my life — though I have driven over it hundreds of time, and gazed at it from the ground — I walked across the Foresthill Bridge. 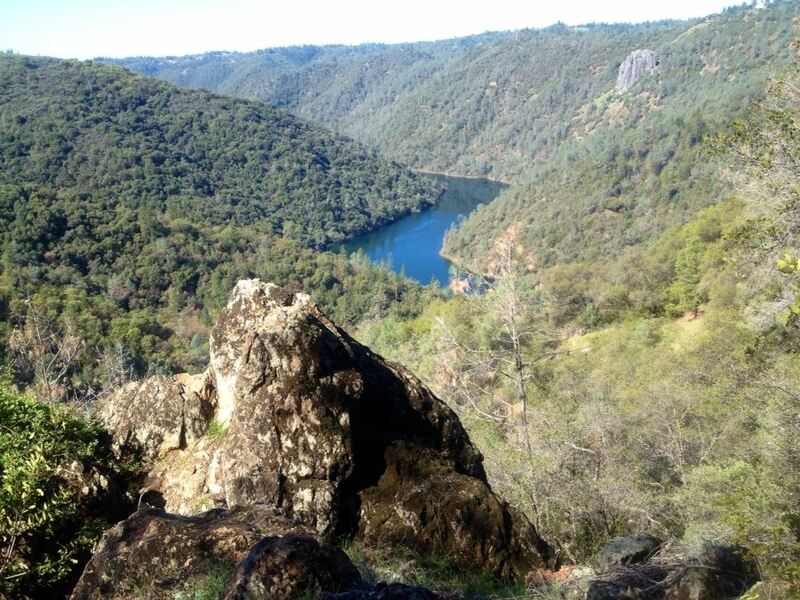 This miraculous structure somehow straddles the confluence of the Middle and the North forks of the American River. 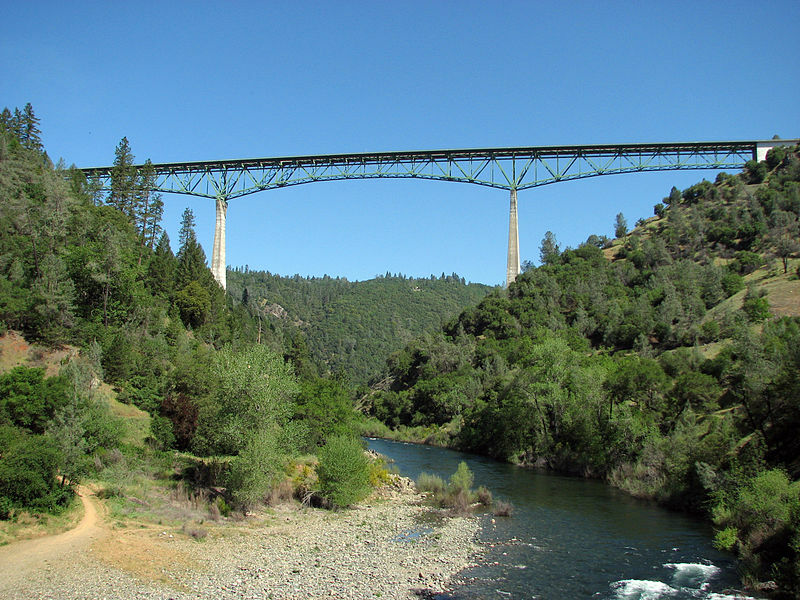 It is the highest bridge, in terms of deck height, in California, and the fourth highest in the United States. 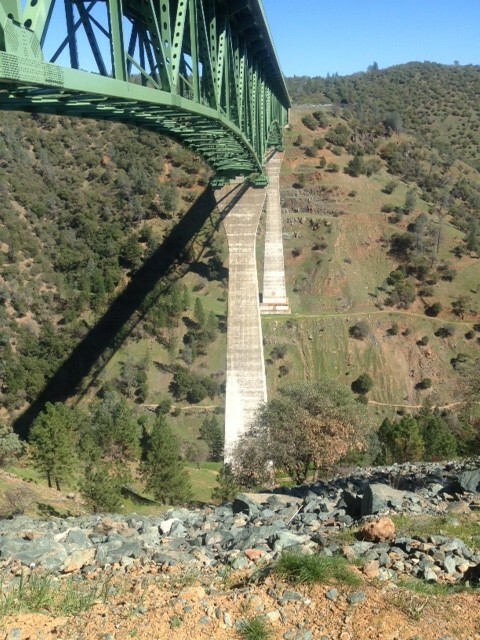 It is sometimes referred to as the Auburn-Foresthill Bridge or the Auburn Bridge. Movies have been made here. The distraught have flung themselves off the mortal coil here, a sickening 731-foot plunge into a granite-crowded river bed. 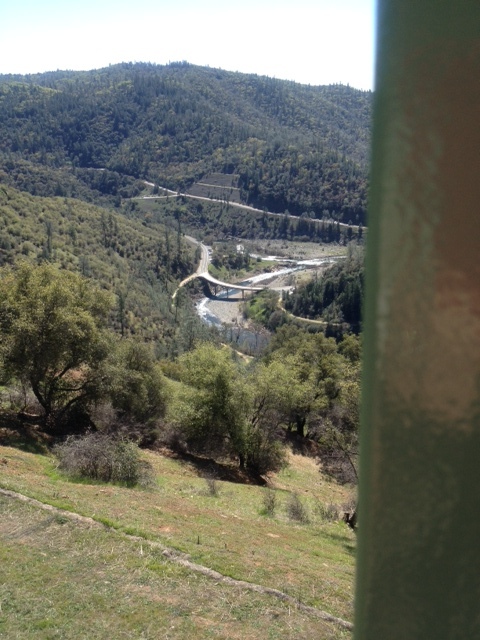 A view of the confluence, left, from atop the Foresthill Bridge. 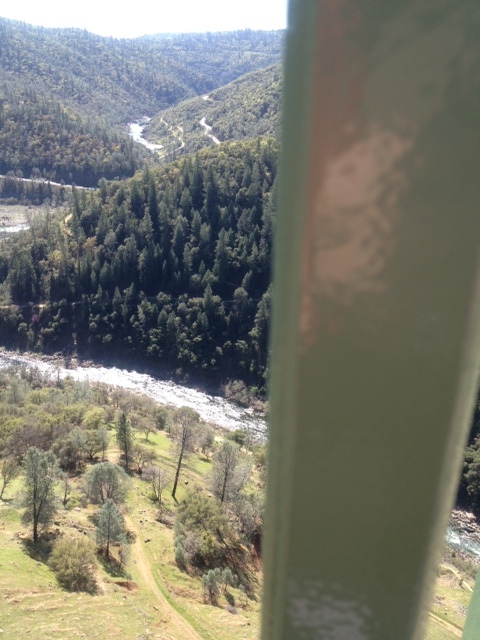 At right, a look down the yawning American River Canyon. Originally constructed to accompany the unbuilt Auburn Dam, the bridge was fabricated in 1971 by Kawasaki Heavy Industries in Japan, re-built here by Willamette Western Contractors, and opened in 1973. I didn’t know any of that. Until my walk in the woods with a bunch of strangers. We stopped just short of nine miles, back at our starting point. Having wound through several microclimates together, up hill and down dale, we had evolved, for a sliver of time, into a community. A society. It was a brief, pleasant alliance, founded in a shared love of nature, forged by a warm spring afternoon’s exertion, and the general goodness of humanity. We’d given each other the benefit of the doubt, and mutually agreed to swap a few hours of our lives for the experience. We parted friends. We went home. Dear Nameless: Thank you! For the comment and the adventure! Gosh dang it, you’re good at this! Beautifully written, which is your style. You are an inspiration to me, when it comes to doing things beautifully. Thank you so much, John. I remember when this bridge was being built. Our neighbor was one of the foreman on the project. Little did I know, then, how much a part of my landscape this bridge would become. See it every weekend as we ride along the Western States trail. It really is a unique landmark. It is an awesome thing to view up close. Civil engineering is a miraculous thing, particularly on this scale. A few people in the group got a little vertigo walking over the bridge — they sort of clung to the concrete abutment away from the edge. Think about what it takes to design and build a thing that is so powerfully moving merely to traverse on foot. Mother Nature does things on a grand scale. We humans, her creations, are capable of some pretty grand gestures too. Would that they were always for good and practical purposes.